Why failure is an option and why are we so afraid of failure? Why failure is an option and why are we so afraid of failure? 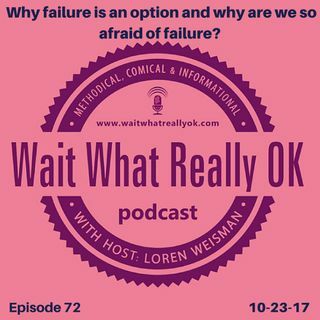 Wait What Really OK Podcast Episode 72 hosted by Branding Strategist and Keynote Speaker Loren Weisman digs in to the taboo of failure and the positive aspects of it. In this day of nothing but positives and this idea that failure is not an option, in many ways that makes no sense. We are overloaded with motivation that delivers no information. Failure is only seen as a negative that we can’t accept. But what about the failures ... Más informaciones where one learns exactly what went wrong and how not to repeat it again? What about the idea of why failure is an option when you can only gain an understanding from a negative result? The idea is not to accept failure, but more so to learn from it. In many ways, more can be learned and understood from things that went wrong over things that simply went right. Ep 72 “Why failure is an option and why are we so afraid of failure?” of the Wait What Really OK Podcast is available on iHeartRadio. Hosted by Branding Strategist and Keynote Speaker Loren Weisman, Wait What Really OK is a Brand Management and Marketing Podcast covering the best approaches for business and the arts today. Podcast Blog Supplement for Episode 72 of the Wait What Really OK Podcast with Loren Weisman. Podcast Link Supplement for Episode 72 of the Wait What Really OK Podcast with Loren Weisman. Personal Branding Podcast Wait What Really OK with Loren Weisman. Podcast Video Supplement for Episode 72 of the Wait What Really OK Podcast with Loren Weisman. Podcast Photo Supplement for Episode 72 of the Wait What Really OK Podcast with Loren Weisman.